Much like bedtime and vegetables, kids and toothbrushes are fickle friends. However, there are plenty of ways to make brushing for kids fun. Here are some top tips straight from the dentists at Smile On Dental & Sleep Apnea Center. If you find it hard to get your child to brush her teeth for 10 seconds, let alone the ADA-recommended two minutes, try adding some tunes to brushing time. Play a song, dance around while brushing, and continue until the music stops. There are plenty of children’s tunes that are around two minutes, and no doubt your child has some favorites. Kids’ interests can change like the breeze, and toothpaste is one of many items subject to a child’s changing opinions. If sticking to a regular brushing routine has become a struggle, suggest to your child that he can accompany you to the store and pick out a new toothpaste. Whether it’s a favorite character or a favorite flavor that wins out, your child’s interest in brushing will be renewed now that he has some “ownership” in the process. It goes without saying that kids don’t value their dental hygiene as much as adults do, but that doesn’t mean they don’t value your dental hygiene. Your child might jump at the chance to practice brushing your teeth, and by extension (and with your positive reinforcement) take a greater interest in caring for her own teeth. If your child sees you enjoying the experience without any pain or complaining, there’s a good chance that she’ll follow suit. Little boys love watching their dad shave, just as much as a little girl enjoys watching her mother apply makeup. So it makes perfect sense to be a role model during brushing time too. Go through your full brushing and flossing routine: brush all of your teeth, massage the gums, and don’t forget your tongue. Make sure your child understands the different steps you take, and sees how satisfied you are once your routine is finished. There isn’t a kid in the world who doesn’t like games. Parents use games to encourage all kinds of good behavior and routine-setting, which makes games involving brushing a natural fit. See who can keep their toothbrush in their mouth longer (note: it might take a few tries to reach 2min), or pretend that zombie sugar bugs are attacking your teeth, and the only way to stop them is by brushing, rinsing, and using mouthwash. The possibilities are endless here, as long as your child has fun. 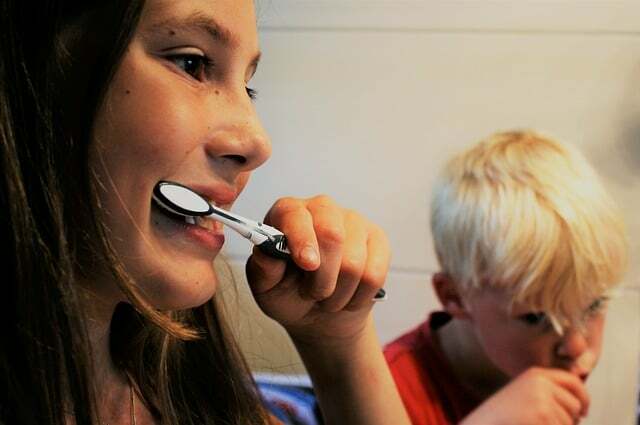 There are plenty of takes regarding rewards for kids and when they’re best used, but for us a reward seems like a good incentive to encourage regular brushing. One popular approach is to create a “brushing calendar” and telling your child that each day he brushes his teeth receives a sticker. As the stickers increase, so too will his anticipation, especially if you offer a big reward at the end of a successful month – i.e. an allowance increase or a toy he really wants. As a top-rated family dentist serving Deerfield and Chicago, Smile On Dental Salon & Sleep Apnea Center is chock-full of recommendations regarding brushing techniques, the best toothbrushes for kids, and much more. Make an appointment with us today and see the difference we can make.